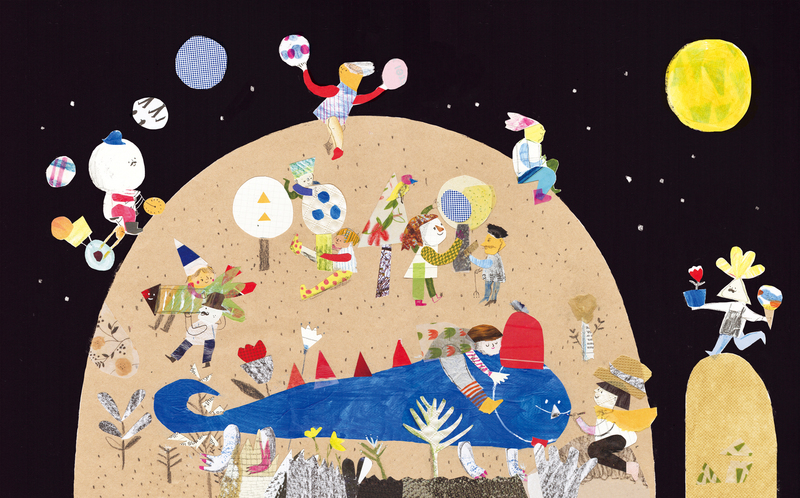 Since 1989, illustrators from Taiwan have often been selected for the Illustrators Exhibition of the Bologna Children’s Book Fair. Selection is a vote of confidence, an affirmation of an illustrator’s ability. 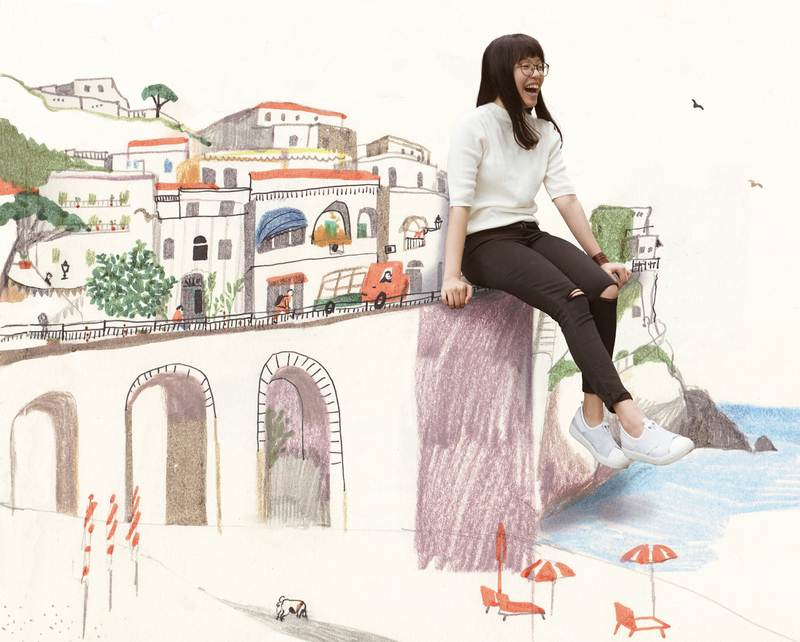 Brushstroke by brushstroke, Taiwan’s illustrators are painting a beautiful picture of our island nation for all the world to see. 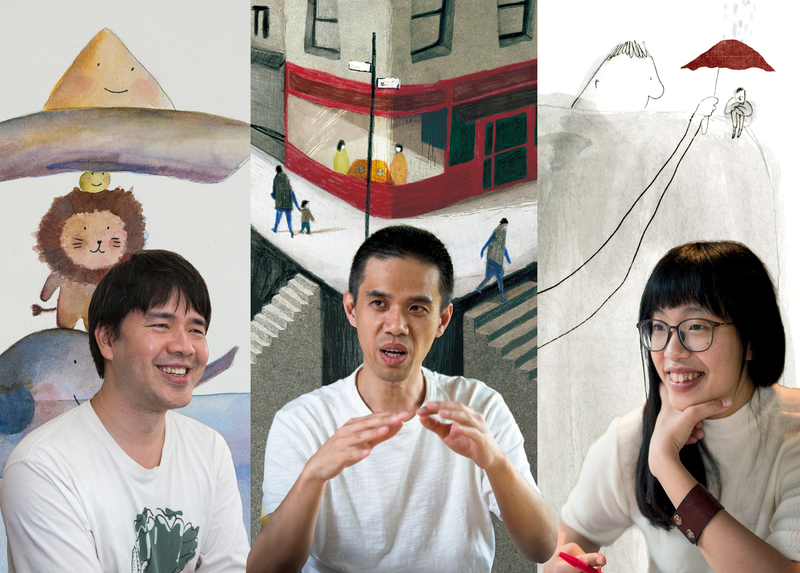 Three such illustrators are Liu Hsu-kung, author of Whose Stop Is This?, a story about a family of cars, Hsu Ming-hung, author of The Last Three Things, a retrospective reverie on important scenes in life, and Cindy Wume, whose Farewell is a meditation on loneliness. 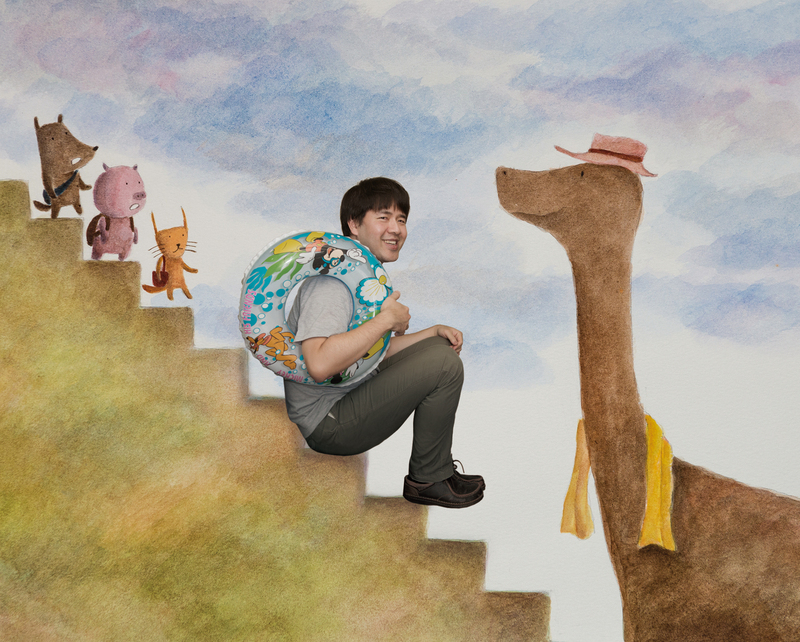 Liu first encountered illustrated books when he was preparing for the entrance exam for graduate school. 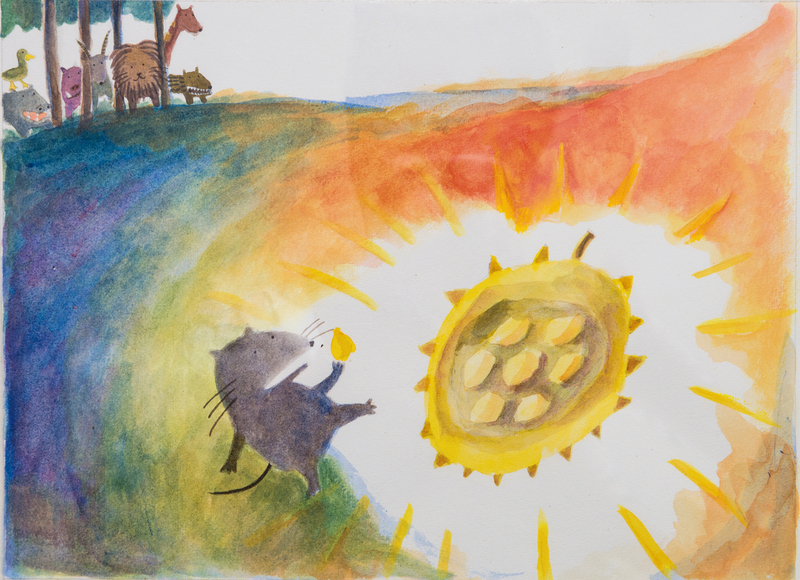 To rediscover his childhood love of drawing, he attended a class taught by Lucy Chen, who mentored him and invited him to be one of the founding members of the Children’s Book Book Club in 1996. At the age of 33 he quit his full-time job and started to illustrate children’s books full time. It’s been 21 years. With a background in the sciences, he structures his stories meticulously. He might consider as many as ten different plots before deciding on how the tale should unfold. In all cases, he aims to avoid rehashing the same clichés. His creative process results in fresh, funny scenarios like the story of The Little Paper Boat: tipping the scales at two beans, the little paper boat should only be able to carry a load of three beans, but somehow manages to ferry an elephant and a lion across a river. It’s a story with a nonsensical twist that will charm children and amuse their parents. 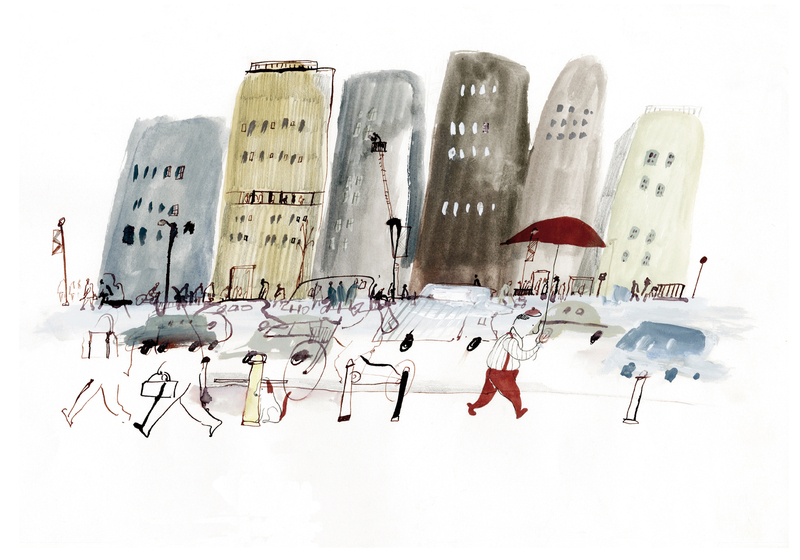 For Liu, illustrating has actually been a process of self-discovery. Once he felt inadequate because, unlike most illustrators, he never went to art school. But then he decided technique was less ­important than his childlike love of the medium. 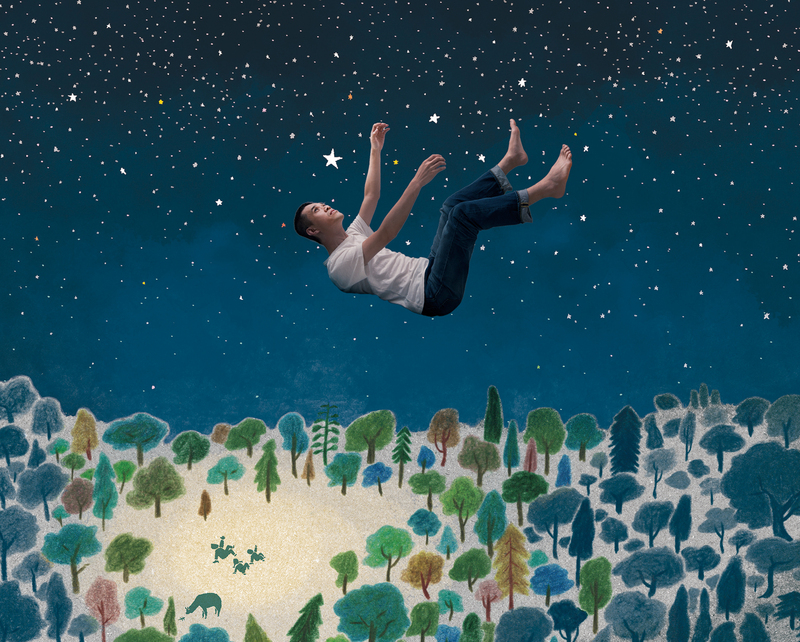 Illustrating is also a very intellectual activity for Liu Hsu-kung: during our interview he kept on engaging himself in a philosophical, almost scholarly dialogue, his way of seeking better answers to difficult questions. Liu feels lucky to have had the chance to take this road in life: “My technique still isn’t anything special, but I can express my fantastical ideas through art, publish my works, and make a living.” Taiwan, too, is lucky to have a superhero of the imagination in Liu Hsu-kung. 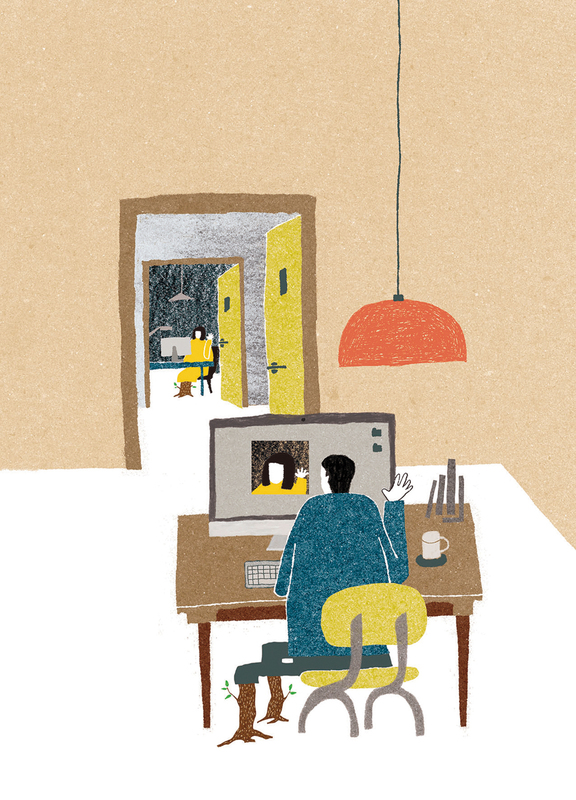 “It probably wouldn’t matter to anyone in Taiwan if there were one fewer deliveryman, but for there to be another illustrator, well, that might be very interesting,” says Hsu Ming-hung, who was selected to take part in the Bologna Illustrators Exhibition in 2015. Unlike Liu Hsu-kung, Hsu did go to art school, where he acquired a formidable almost photorealist technique. He can paint pictures in which iron looks like iron, water like water, just like life. And that’s how he worked earlier on, requiring himself to meet exacting standards of light, material and perspective; he thought that was true skill. But after his grandfather passed away, he was called back from his job at a design firm to work as a deliveryman for the family business, a grocery shop. Though he was helping out at the shop, he never lost his love of art. Seven years later he finally took up his brush again, but this time he changed his approach, forgetting all the rules he learned at art school and instead conveying his finer feelings onto the page. 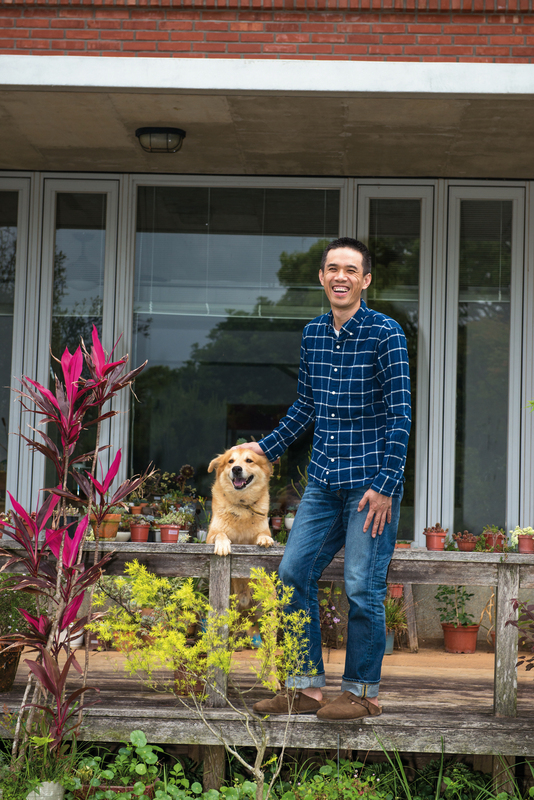 He ­credits his wife, fellow illustrator ­Hsueh Hui­yin, for his change of tack. The work that won Hsu an invite to Bologna is The Last Three Things, which he finished three years after he started creating art again. The illustrations were originally supposed to be for a work of fiction about a watchmaker’s workshop in the forest. But Hsu ended up adding here and there, introducing new plot developments as he painted new pictures. It turned into the story of a person who happens to buy three magical bottles; that evening he dreams of three formative events in his life, journeying deep into the landscape of his mind. It was this profound psychological exploration that caught the eye of the judges. Since the exhibition, his life has remained the same: he gets up and draws in the morning and helps out at the family store in the afternoon. He still dreams of taking another trip into the larger world, but feels he can take it one step at a time. One more illustrator in the world really is something, because he makes the real world a more interesting place to live in. Cindy Wume has come full circle: after three years in an art stream in junior high, she left art to try other things in high school and college, but has now decided to return to art, to center her life around drawing and painting. “To me, painting is something I always enjoyed, but when I got to high school I was under a lot of pressure and didn’t find the same pleasure in it.” So she switched to a regular academic high school and took foreign languages at National Cheng Kung University, where, after classes, she used to participate in nongovernmental organization projects. On one such project she went to India to provide assistance to impoverished children. “At first I was teaching them English, but then I started showing them how to draw.” That’s how she rediscovered the joy of drawing. She did a lot of doodling in India and made some local friends, both of which helped her realize that life isn’t just about finding a steady job. Maybe everyone can find some form of labor that isn’t work. For Wume it’s painting. But enjoying something is hardly the same thing as doing it professionally. So she decided to go to England to study illustration. She had some setbacks along the way. She went back to zero, had to start all over again when she realized how far behind her classmates she was. Sometimes she just couldn’t get it right. “I felt like I’d never see the day when I got really good,” she said, reliving her despondency. But she never gave up. She persevered, often spending over ten hours a day drawing. Sometimes it was all she did besides eating, bathing and sleeping. Check out her Instagram account and you’ll see in over a hundred works how hard she tries. A habit she picked up in England, she carries a sketchbook with her wherever she goes and draws whatever she sees. “Less is more,” a principle she learned from her teacher in England, is her motto. 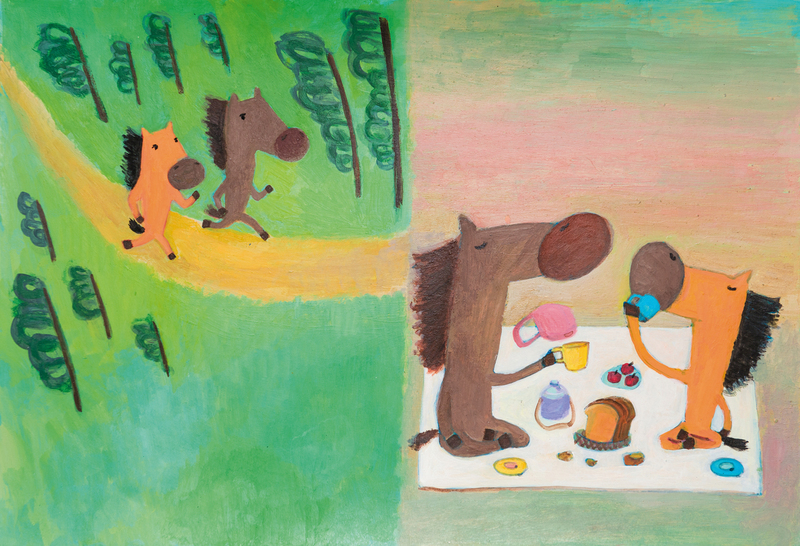 Her style is simple, her palette plain, but her pictures are filled with emotion and childlike whimsy. A person who often describes her approach to drawing as freestyle, she never makes a draft before she paints. Instead, she does the composition in her mind, in order to retain freedom when she puts brush or pen to paper. 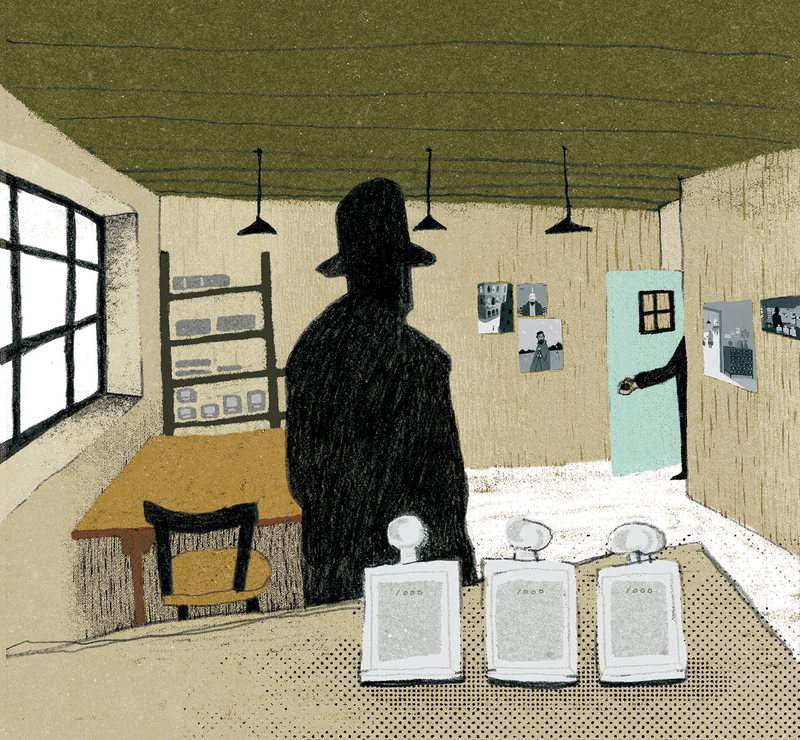 The work that was accepted for the Bologna Illustrators Exhibition is called Farewell. It was actually her graduation project for art school in England. It was a stroke of good luck that she was selected, and an affirmation. It gave her an injection of energy when her self-confidence was low. It was also an opportunity to get noticed, and to keep on moving towards a career in illustration. 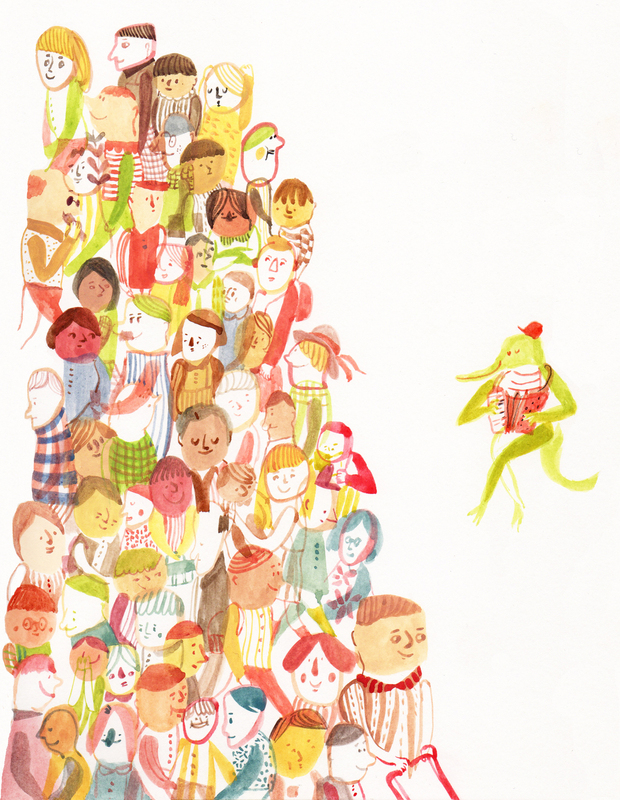 Having decided to make a living at illustration, she came back from England last year. At first, she was just getting started, and felt like she couldn’t let any opportunity go. Soon, she had taken on a lot of different projects. But now she chooses to leave some space “blank” in her daily life, time she spends creating—making her own art and writing her own stories. To Wume, painting is life, and drawing is like breathing, both natural and necessary. 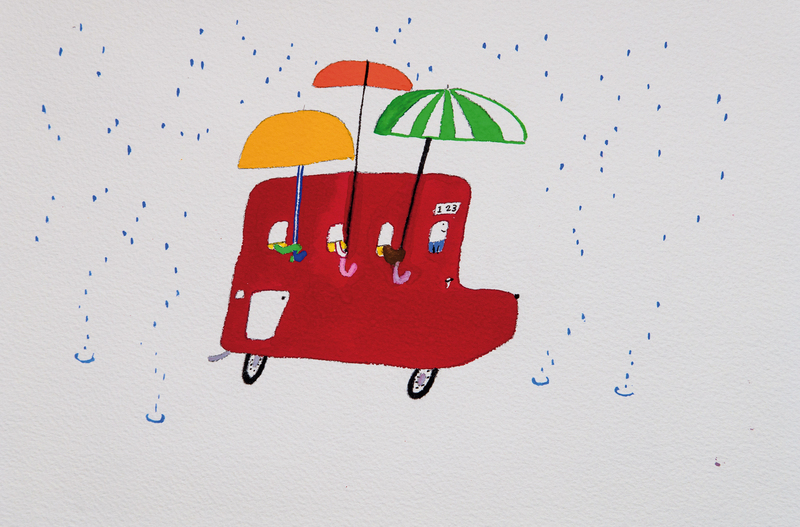 On her Facebook you can often see her sharing her sketches, which she makes when she is traveling or at a café. Having entered the worlds of illustrators and listened to their stories, maybe one day you too will want to take up the pen and doodle your thoughts and feelings.